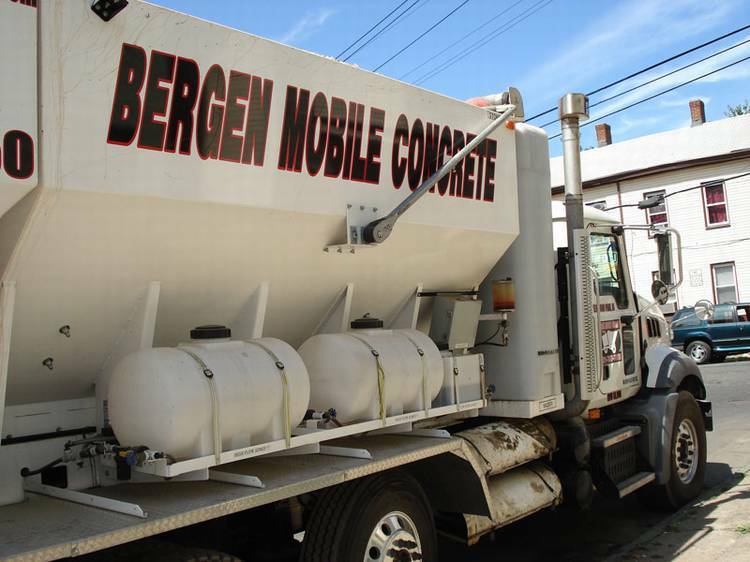 Bergen Mobile Concrete uses Metered Mobile Concrete Mixers which allow us to provide the exact amount of concrete made to the mix design that you specify. 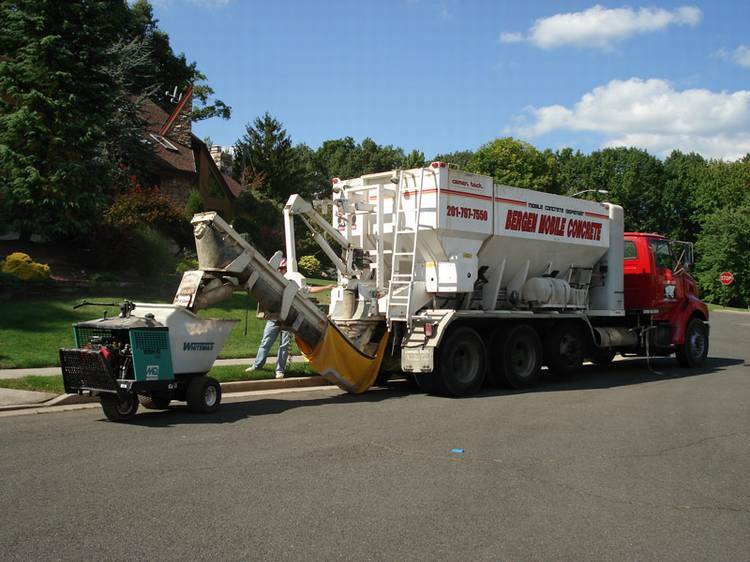 The Mobile Mixer eliminates the waste associated with the traditional ready mix truck. With the traditional ready mix truck the customer has to predetermine (guess at) the quantity needed to complete the project. It is a common practice to order extra material to compensate for errors made in calculating the volume needed, extra material that you will have to pay for. Some ready mix companies suggest ordering an extra 10% and some even add an extra 10% onto the concrete calculators they supply. When using a Mobile Concrete Mixer, the customer only pays for the material that is used and that saves money. You won’t have to worry about running short and then calling for a second truck. 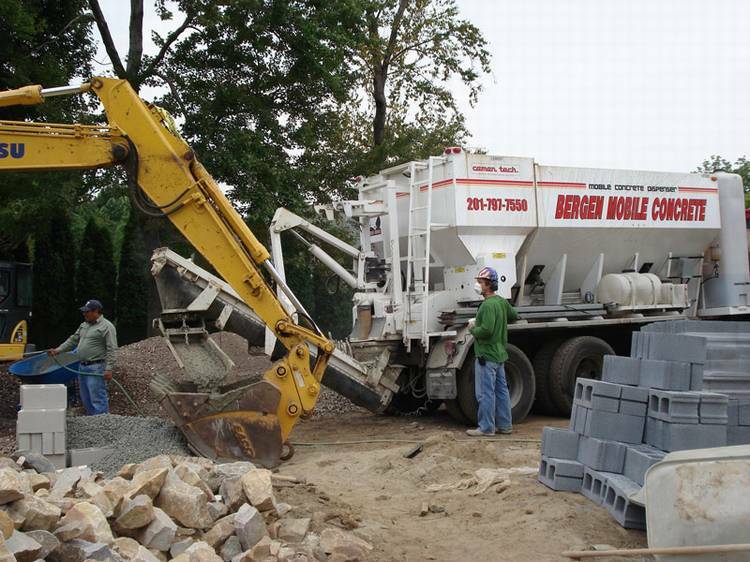 With Bergen Mobile Concrete you can just let us know the most you think you will use so we will know how much to bring and then after we mix the concrete we only charge you for what you actually use in ¼ yd increments. Our trucks can bring as much as 11 yards in one delivery. You are pouring an irregular shaped footing and you think you will need between 1 and 2 yards of concrete. Assume the Mobile Mixer and the Ready Mix truck both charge $100.00 per yard for the concrete and $150.00 for the delivery. After completing the job you find that you used 1½ yards of concrete. 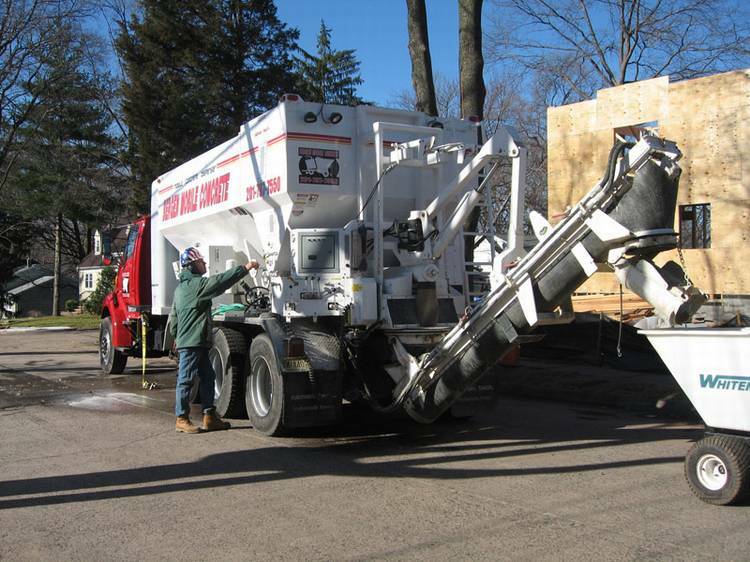 With the Ready Mix truck you would typically order at least 2 yards of concrete to make sure you don’t run short. This will cost you $350.00. You just paid for ½ yard of concrete that you didn’t even use. With the Mobile Mixer you would tell the dispatcher you need at least 2 yards of concrete. After only mixing 1½ yards your bill for the same job would be $300.00. This would give you a $50.00 savings. You are pouring 50 ft. of 4″ sidewalk 4′ wide. You calculate that it will take 2 ½ yards and you place your order. Again assume the concrete is $100.00 per yd and the delivery is $150.00. Unfortunately, somebody forgot to check the depth of the sidewalk and it was actually 5″ deep. The actual amount used was 3.1 yards. With the Ready Mix truck you order 2 ½ yards and this costs you $400.00. You run short by .6 yard so you call dispatch to order another truck. They tell you they can have another truck out to you but it won’t be until 4:00 and you will have to pay for a whole yard and the delivery. This additional truck cost you another $250.00. Once again you pay for .4 yard that you don’t even use. You total cost is $650.00 for 3.1 yards of concrete plus overtime for your crew. Need Answers or Technical Assistance?